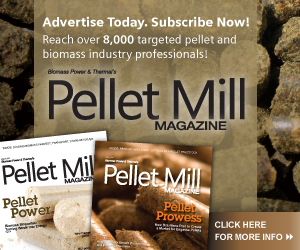 BBI International and Biomass Magazine have named their annual industry award winners as J. Richard Hess of Idaho National Laboratory and Highland Pellets of Pine Bluff, Arkansas. Mitsubishi Corp. Power Systems Inc. and Kansai Electric Power Co. Inc. (KEPCO) have established a new joint venture that will promote and develop biomass power generation business in Japan. Bioenergy industry leaders gathered in Minneapolis, Minnesota, on April 11, for their annual state-of-the-industry discussion at the 10th International Biomass Conference & Expo. A new report by the International Renewable Energy Agency finds that 2016 was a banner year for addition of global renewable energy capacity, and bioenergy specifically. The first few months of the new presidential administration have left the legislative future for biomass thermal energy uncertain. However, the Biomass Thermal Energy Council sees opportunities to advance biomass thermal adoption. Ideology may again be one of the greatest threats to residential wood heating, and all renewables. If the Trump administration undermines renewable energy policies, there may be less momentum to make our stoves even cleaner and more efficient. Passed in a 30-0 vote, Oregon Senate has passed a bill that adds woody biomass to list of types of green energy generating technology that must be included in the construction, reconstruction or renovation of public buildings. The Challenge establishes Bio-Based conversion platforms to support emerging technologies and complete utilization pathways for the delivery of Bio-Based products.